A trip to Quebec City is like taking a deep dive into Canada’s most magical and incredible history. There is a great range of things to do in Quebec City, and the cliche that a visit to the city is like experiencing Europe without leaving North America is actually true. 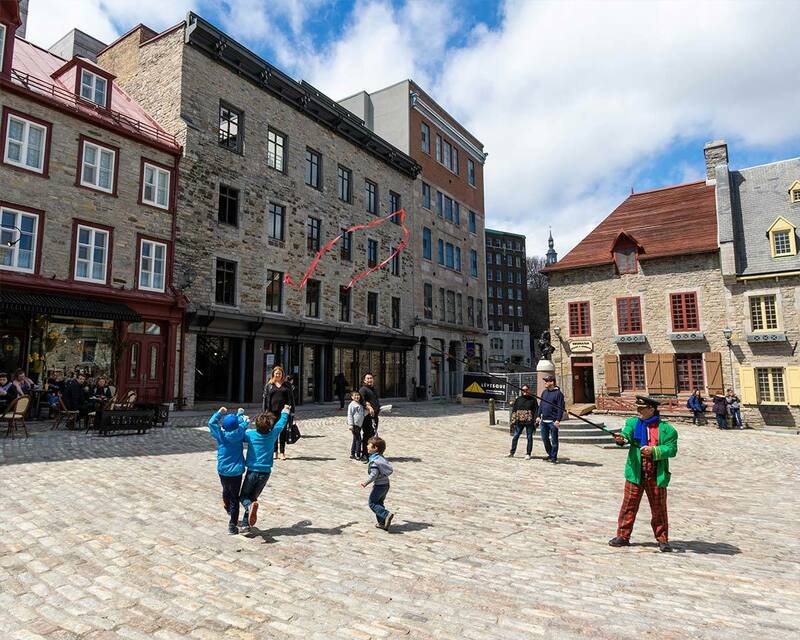 And, whether you’re exploring as a couple, solo, or visiting Quebec City with kids, you are guaranteed to find it fascinating and beautiful. We are lucky enough to live within an 8-hour drive of Canada’s oldest city and have been here a number of times. And the truth is, the charm of Quebec City never wears off. Any visit to the province of Quebec just wouldn’t be complete without experiencing the city. Not only is Quebec City old, established back in 1608, it’s also beautiful. The city sits on a high plateau overlooking the gorgeous St. Lawrence River. And Quebec City’s combination of old-world charm and new world flavors make it one of the most sought after destinations in the world. 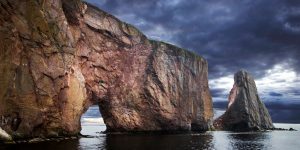 We stop here on our road trips along the St. Lawrence towards the beautiful Gaspe Peninsula. And sometimes we’ll head here just to experience some new things to do in Quebec City. What Makes Quebec City So Incredible? Quebec City offers one of the best tastes of the old-world within the Americas. There are no other cities in North America that come even close to the style and atmosphere of European cities than Quebec City does. Quebec City is also the capital of the Province of Quebec, the only province in Canada where the first official language is French rather than English. Quebec City’s position on the cliffs above the St. Lawrence River made it a perfect point of defense during the cities early battles with British and American forces. And the walled city of Old Quebec City was a safe haven for businesses and civilians closer to the water. Quebec is a year-round destination. During the winter people flock here for great Quebec City things to do such as Carnival, the largest winter festival in the world. 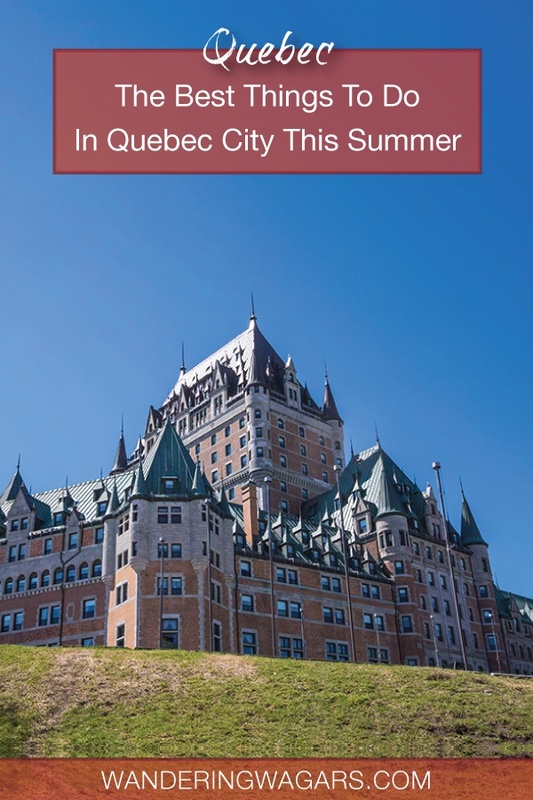 But a visit to Quebec City in the summer is an entirely different experience. Winters in Quebec can be frigidly cold. But the summers are spectacular. 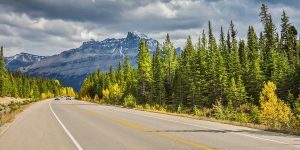 Temperatures are comfortable, days are often bright and sunny, and the long Quebec days make it easy to pack in as many things to do in Quebec as you can handle. Quebec City is a place that is best explored on foot. When you are searching for amazing Quebec City attractions, a good chunk are located in the tightly concentrated area of Old Quebec City. But, there are a few things to do in Quebec City that require access to either transit or a car. We usually visit on a road trip to Quebec City, so it’s rare that we don’t have our car with us. But, luckily Quebec also has a decent transit system to help you out if you need it. 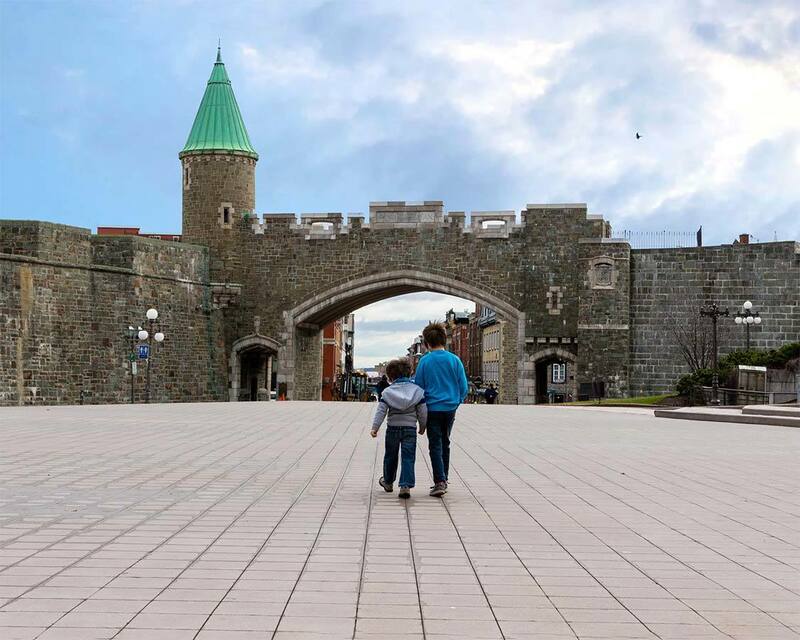 Here are some of our top places to see in Quebec City for the whole family. Quebec City is home to some of the most epic and important battles in Canada’s history. In 1759 the battle on the Plains of Abraham was a turning point in the 7 Year War war between the British and the French. 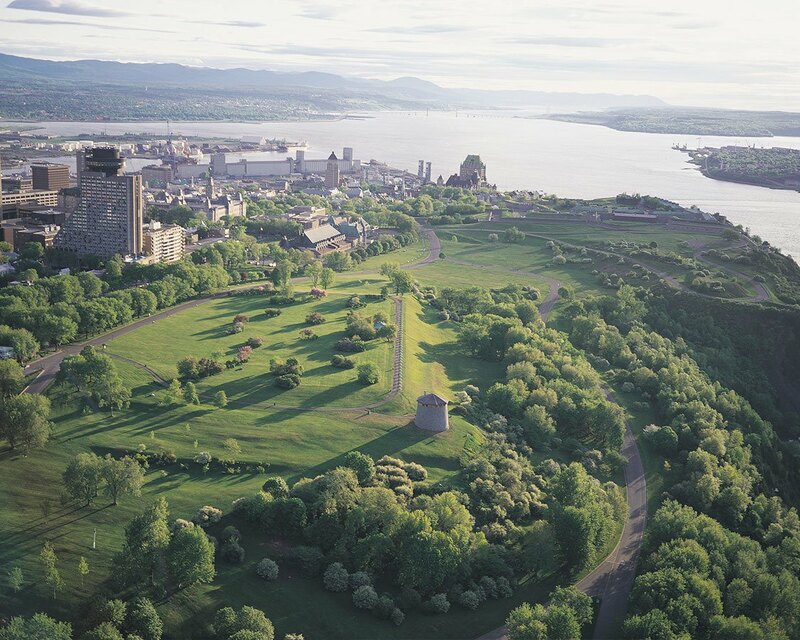 While many battlefield locations of those days have been paved over or returned to farmland, the Plains of Abraham have been transformed into a 243-acre city park. The Plains of Abraham act as a focal point in both the Carnival celebrations in the winter and massive music festivals during the summer. 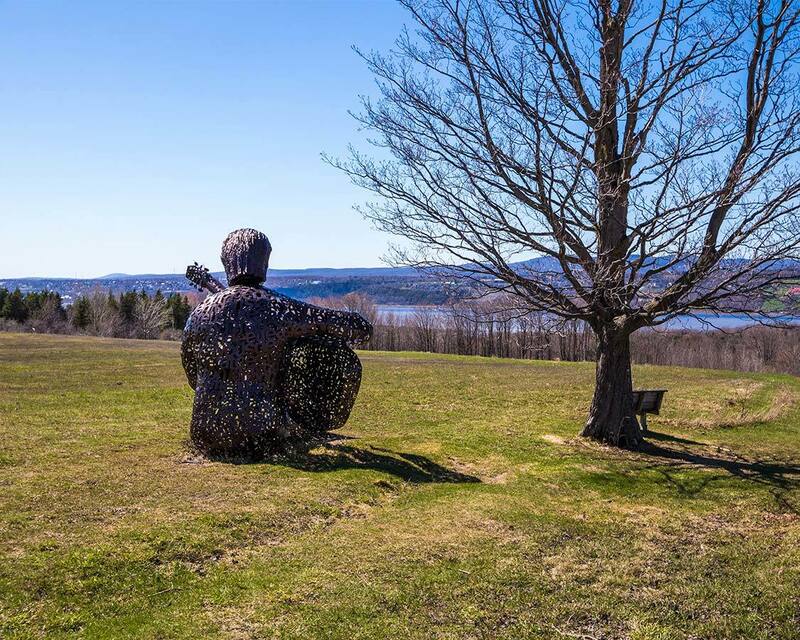 This beautiful piece of land is a great place for scenic walks and hikes, picnics, and just lounging around and taking in the sounds and smells of Quebec City. You can even get up close and personal with some of the ancient cannons that were once used on the Plains. For a deeper understanding of the history of the Plains of Abraham, make a visit to the Discovery Center. Here you’ll learn about the rich history that helped shape Quebec City and the province of Quebec. The Plains of Abraham are to Quebec City what Central Park is to New York City and Hyde Park is to London. It’s where the city gathers, celebrates, mourns, and relaxes. La Citadelle de Quebec or the Citadelle of Quebec can’t be missed if you are looking for amazing things to do in Quebec City. 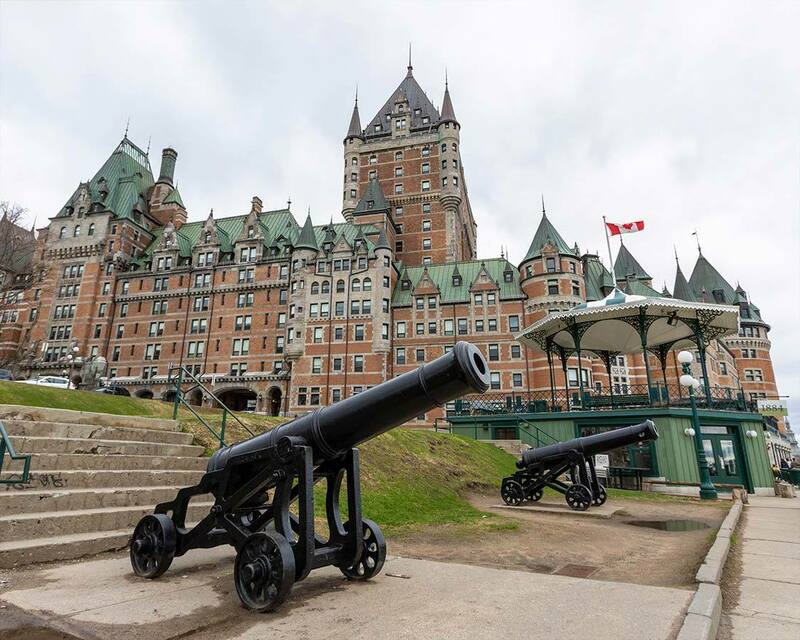 This historic fortress overlooks the city offering one of the best views of Quebec City and Chateau Frontenac that you can ask for. To top it off, The Citadelle of Quebec is still an active military base. It also contains one of the official homes of Canada’s Lieutenant General. The Citadelle of Quebec contains a fascinating museum documenting the local regiments history through wars dating back to WWI. You can also go on guided tours through the Quebec City military base. The tours must be guided as this is an active base. What makes the Citadelle tour one of the best things to do in Quebec is the sweeping views of Old Quebec from the top of the fort walls. You can even check out the massive cannons designed to protect the city from attacks down the St. Lawrence. 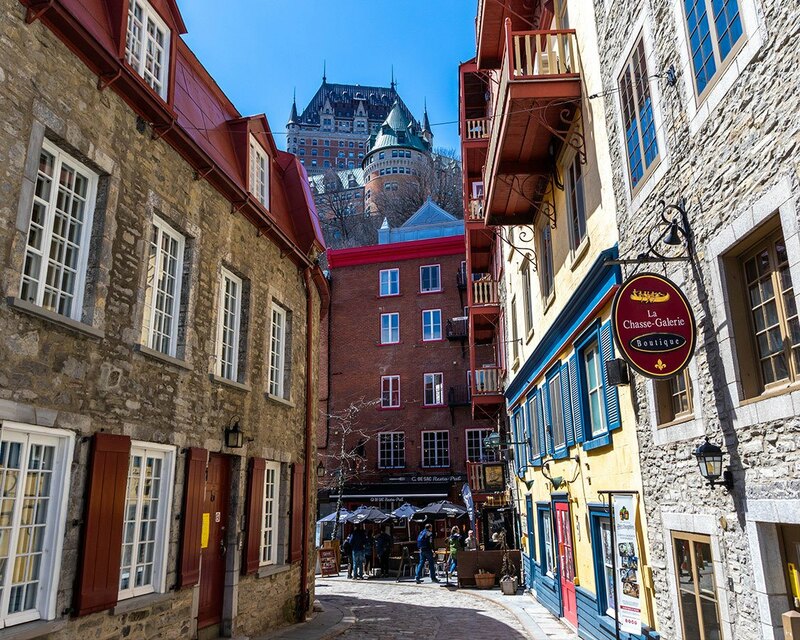 Old Quebec is one of the coolest places to visit in all of Canada. There is simply no other place where the rich history of the country is on such a dramatic display. During the summer, the streets of old Quebec are lined with horse-drawn carriages taking families and couples along the cobblestone streets of Canada’s oldest city. The streets are filled with cafes, art displays, and many hidden sculptures that tell the story of Quebec’s diverse history. Take a stroll to Parc Montmorency between Cote de la Montagne and Rue Port-Dauphin (not to be confused with Parc de la Chute Montmorency) where the Parliament of Lower Canada and Quebec was situated from 1791 till 1883. You can also find the oldest house in Canada. Built in 1675, this beautiful red-roofed building on rue Saint-Louis has been transformed into a restaurant called Aux Ancien Canadien. 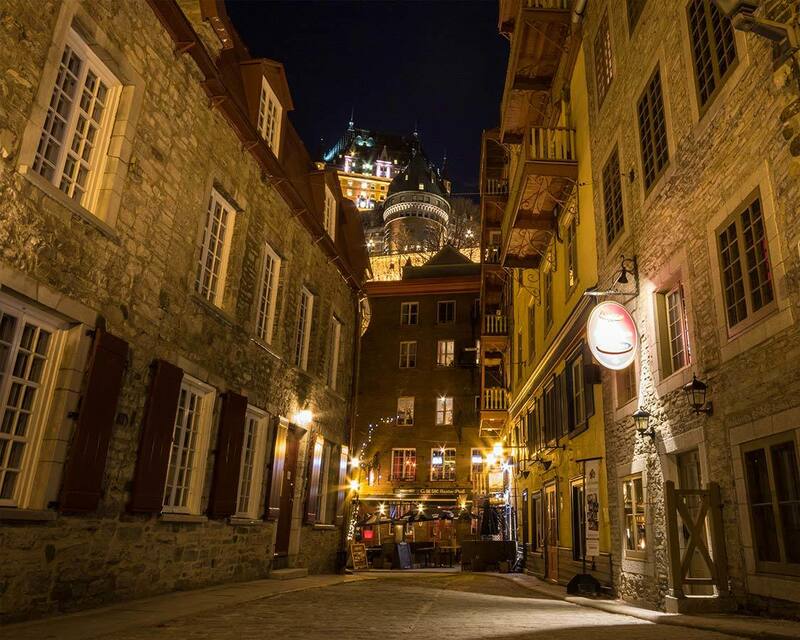 Although if you truly want to step back in time, we recommend you dine in lower Quebec. You can read about that a little further down. Another must is a walk along the walls of Chateau Frontenac, the most photographed hotel in the world. This castle-themed hotel is gorgeous from every angle. But we love exploring along the boardwalk lining the St. Lawrence River. Here you can find the fascinating, underground Lieu historique national des Forts-et-Châteaux-Saint-Louis. This was the official residence of the French Governor of New France (as Quebec was once called). 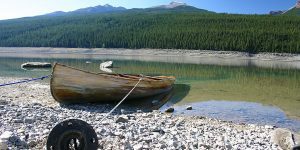 It is one of Canada’s newest National Historic Sites, having just been registered in 2002. For a closer look, you can walk within the arched parkway of the Chateau Frontenac. It’s accessed off of Rue Saint-Louis. This is the main entrance for those staying who are staying at Chateau Frontenac, and it is one of the most dramatic hotel entrances around. 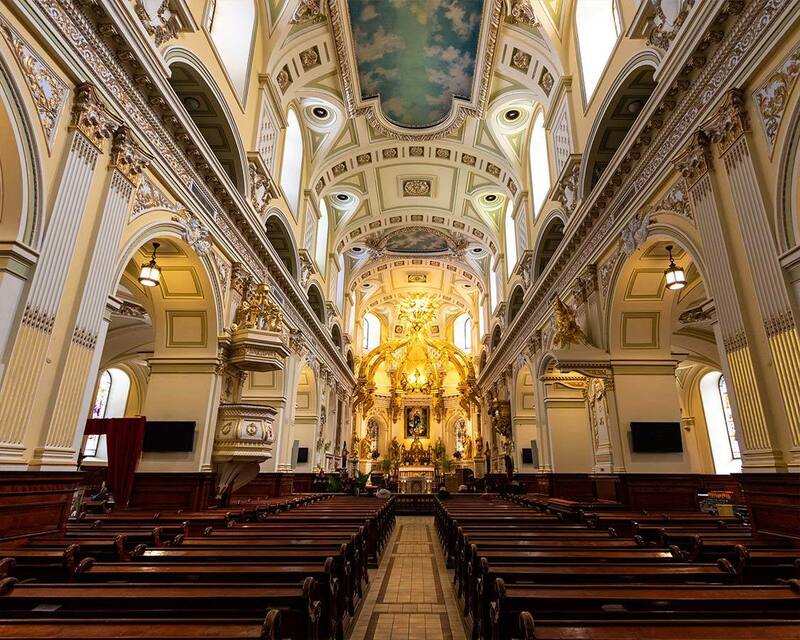 Catholicism has played a huge roll in the history of Quebec, and there is no better place to explore a bit of that history than at the Basilica of Notre Dame in Quebec City. Notre Dame Basilica has been standing since 1647 and has born witness to nearly the entire history of modern Canada. It has been gutted by fire a few times in its history. This includes once in 1922 when Canada’s Ku Klux Klan attacked the church. In 2014, to celebrate Notre Dame’s 350th birthday, it was given a holy door. This holy door is only the 8th of its kind worldwide. The door is currently sealed by mortar and cement and is scheduled to be unveiled again in 2025. The Musee de la Civilization is one of the most popular museums in Quebec City. This highly engaging and interactive museum has a heavy focus on Canadian First Nations history but also touches on Canadian and popular culture. The Musee de la Civilisation is open Tuesday to Sunday from 10 am to 5 pm. Adult rates are between $17-$22 depending on the current exhibits. There are reduced rates for children 18 and under, and children under 11 are free. There are a few ways to get from upper Quebec City to Lower Quebec City. You can either take the stairs or, you can opt of the scenic route on the Old Quebec Funicular (Funiculaire du Vieux Quebec). The Quebec City funicular takes visitors between Dufferin Terrace near Chateau Frontenac and Quartier Petit-Champlain in lower Quebec City. The Quebec City funicular runs from 7:30 am to 10:30 pm most weekends and from 7:30 am to 9:30 pm during the week. It costs $3.50 per person each way. Lower Quebec City is perfect for those who just can’t get enough of the old world vibe when looking for things to do in Quebec City. From the iconic Blvd. 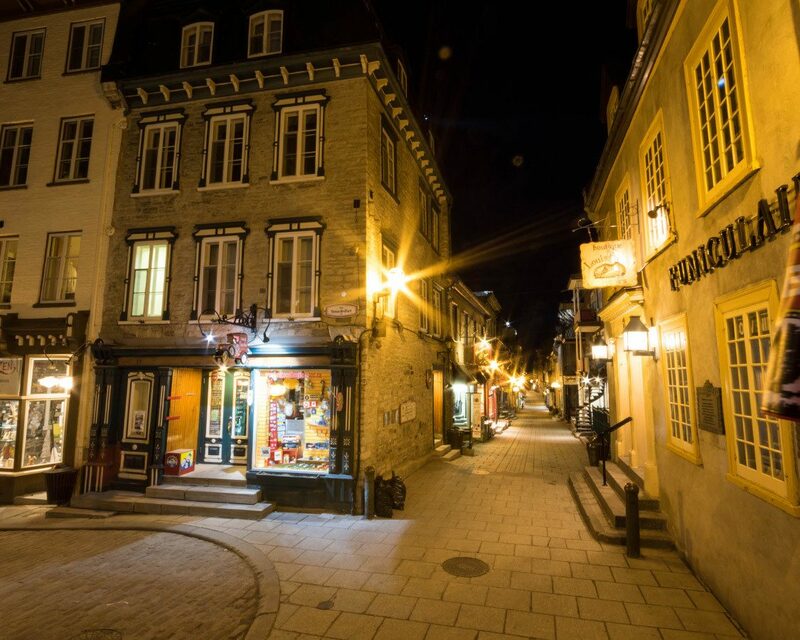 du Champlain, to the second oldest restaurant in Canada (and in our opinion, one of the coolest), Lower Quebec City is perfect for those looking to shop, explore, and get a taste for one of Canada’s oldest neighborhoods. The Petit Champlain district is lined with stores housed in centuries-old stone buildings. There are even some archaeological sites where even older houses and buildings are being excavated. 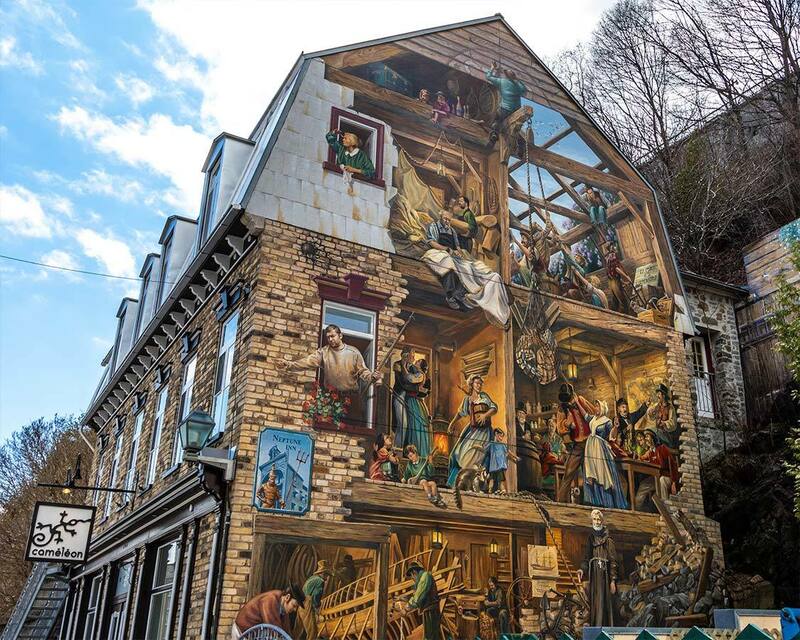 During summer in Quebec City, these streets are dotted with street artists, magic shows, and many more family-friendly activities. Make sure to make a stop at Bistro Le Papes Georges on Rue du Cul de Sac. This pub is Canada’s second oldest restaurant. And simply walking inside gives a mind-blowing look at how these restaurants were run centuries ago. There is one small stove located behind the bar. The staff are fun and love to share stories about the history of the restaurant. You can also walk to the back room where you can watch the water pour down the inside wall, which is one of the rock faces leading to the upper city. You can find more about Bistro Le Papes Georges here. The Quebec City ferry terminal is located just steps away from Lower Quebec. The Quebec to Levis ferry is a great way to take in the view of Quebec City with the St. Lawrence River in the foreground. The Quebec City ferry itself isn’t a thrill-a-minute-ride. But, it’s worth the short 20-minute one-way trip for the views alone. Before you go check out the ferry schedule on their website here. The Quebec City Aquarium is just 15 minutes from downtown Quebec City. 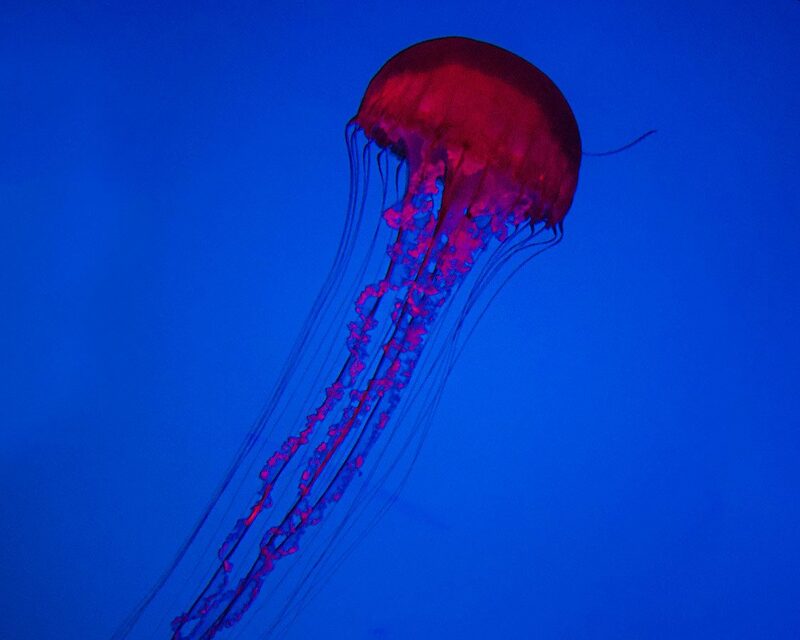 This is one of the most popular attractions in Quebec City due to the 10,000 different marine animals that are housed at the Aquarium of Quebec. The fun isn’t limited to the inside of the aquarium either. There is a tree-top walk, water games and outdoor walking trails along the St. Lawrence River. The best things to do in Quebec City don’t stop at the town borders. 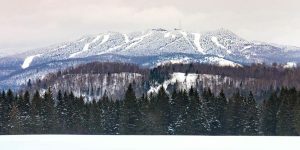 There are lots of things to do near Quebec that are both easy to access and loads of fun. Parc de la Chute-Montmorency is an outdoor park just 15 minutes from downtown Quebec City. The Parc de la Chute Montmorency is where you’ll find the spectacular Montmorency Falls. This dramatic 83-meter (272 foot) waterfall is visible from the highway. From within Montmorency Falls Park, you can take a panoramic cable car from the base to the top. 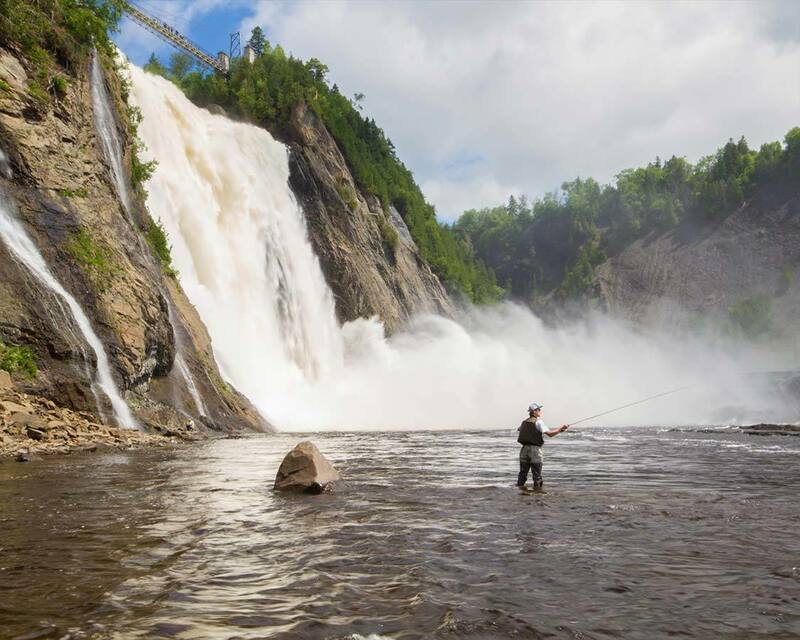 Other great activities at Parc de la Chute-Montmorency are walking across the dizzying suspension bridge above the falls, speeding along a zip line through the mist of the falls, and enjoying the many viewing platforms of the Montmorency Panoramic Stairs. During the summer you can also test your courage on the Via Ferrata. The Via Ferrata is a series of suspended cables along the cliffs of Montmorency Falls Park that offer some of the most amazing views of the falls and the surrounding area. You can find out all you need to know about visiting Parc de la Chute-Montmorency here. The scenic Ile d’Orleans is connected to Quebec City by a single bridge that is dramatically positioned at the base of Montmorency Falls. The island is a popular destination for both tourists and locals alike for its variety of wineries, farms, and heritage homes. At one end, take in the views from the Saint Francois observation tower. On the other end of the island, check out the Ste Petronille vineyard. Dotted throughout the island are great examples of the rich creative history of Ile d’Orleans. One of our favorites is the sculpture field that is just a short drive from the bridge along HWY 368. You can also stop for a visit at many of the artisan outlets and the fruit and vegetable stands throughout the island. You can explore an entirely different side of Quebec just 30-minutes away from the city at the Parc National de la Jacques-Cartier. 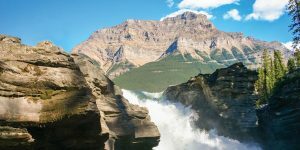 Here you can experience beautiful glacial valleys among the mountains of Quebec. Explore the 550-meter channel carved into the valley by the Jacques Cartier River. You would never know that you are so close to Quebec City. 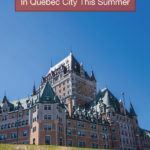 But it’s easy to do a day trip from Quebec City to Parc National de la Jacques-Cartier and still have plenty of time for other things to do in Quebec City. The park has loads of hiking trails, biking trails, kayaking, and even white water rafting during the summer. During the winter, kick-sledding, as we did in Kirkenes Norway is a popular activity. The Basilica of Sainte-Anne-de-Beaupre is just a 30-minute drive from Old Quebec City. This stunning shrine and series of churches in the Quebec countryside has been credited with a series of miracles where sick and disabled people have been cured. Over 500,000 pilgrims make the trip to the Sainte Anne de Beaupre shrine each year. 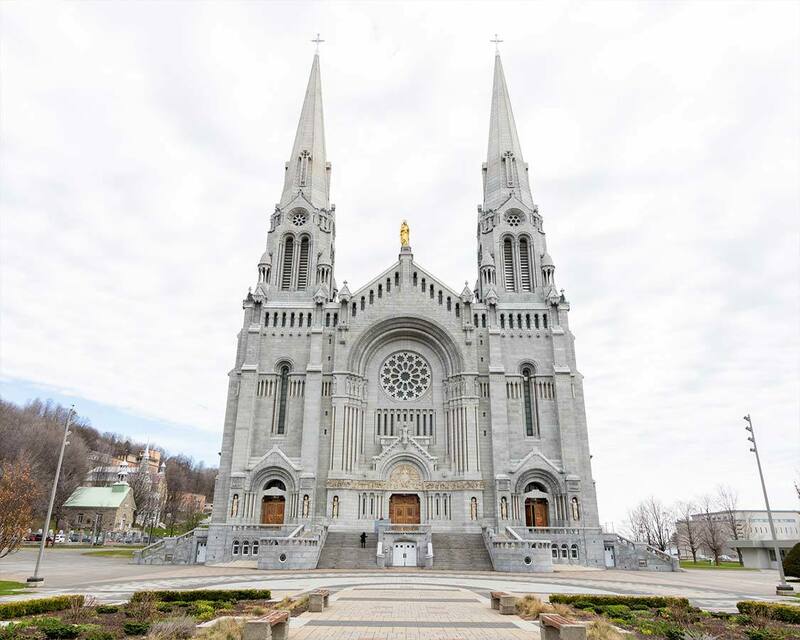 But, even for those who aren’t Catholic, a visit to Sainte Anne de Beaupre is one of the most popular things to do in Quebec City. The shrine is a beautiful church. This massive structure stands out from the idyllic countryside with its bright white walls and towering stained glass windows. Although this modern church stands out from the crowds, the surrounding streets contain shrines dating way back to 1658 when the land was originally donated to the Catholic church by a local farmer. The shrine saw its first miracle in the same year and has since become one of the most important pilgrimage sites in North America. 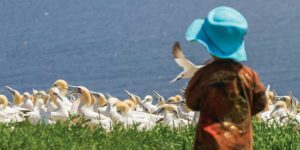 Just minutes from Quebec City is one of the best ways to explore Canadian indigenous traditions in all of Quebec. 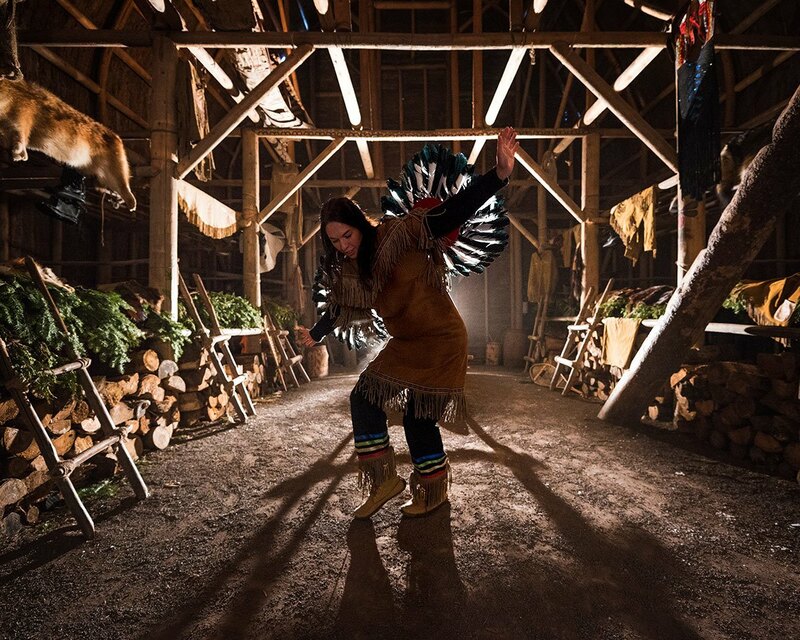 At Wendake you can experience both the indigenous and colonial side of First Nations history within Quebec. You can visit the traditional Huron site, a recreation of a Huron village that offers a glimpse into the traditions of the Huron-Wendat Nation. You can also visit Notre-Dame-de-Lorette Church which began construction in 1730. It has since gone on to be designated as one of Canada’s National Historic Sites. You can also visit the Tsawenhohi house, built between 1807 and 1820 for Chief Nicolas Tsawenhohi Vincent. There are guided tours, craft demonstrations, archaeological artifacts and more. If you are visiting Quebec near the end of June, check to see if the Wendake International Pow Wow will be on during your visit. This massive event features drummers, dancers, and food from Indigenous groups across North America. You can read about our experiences at Ontario Pow Wows here. Cap Tourmente National Wildlife Area is about A 40-minute drive from Quebec City and can be easily paired with a visit to Sainte Anne de Beaupre Basilica. This beautiful wilderness area near Quebec City contains marshland, plains, and forests. It was established back in 1978 and is one of the most important migratory stops for a huge number of birds including the greater snow goose. Cap Tourmente also has several historic buildings documenting the 400-years of farming and industry of the land. 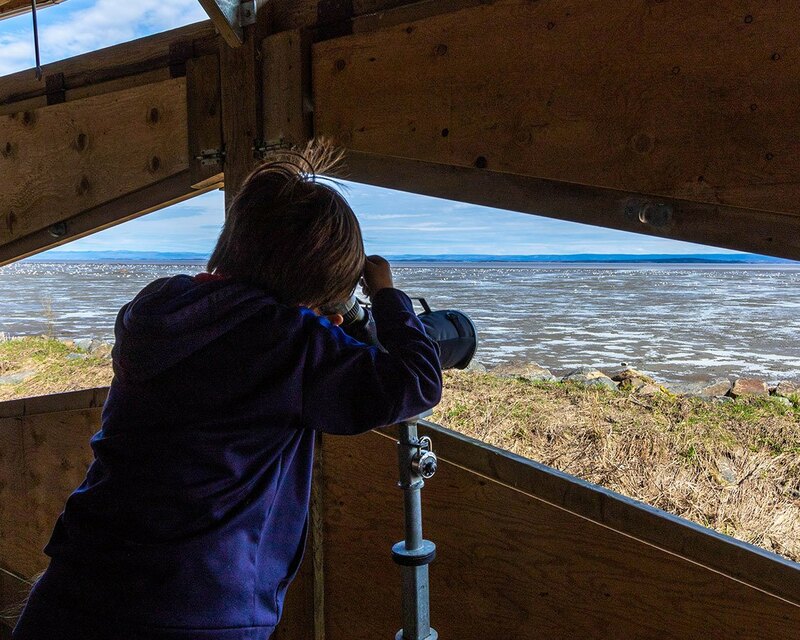 Enjoy the well-maintained boardwalks and supplied canopies and spotting scopes for bird watching along the shores of the St. Lawrence. There are over 20 kilometers (12.5 miles) of trails, an Interpretation Center, and picnic areas to help you fill your time at Cap Tourmente NWA. Quebec City is one of the best foodie destinations in Canada. Not only is it the birthplace of Canada’s most iconic junk food, Poutine, but the city’s rich history and cultural significance have led it to attract world-class chefs. But if you are looking for great family-friendly restaurants in Quebec City, you’re in luck. You can have great food and a fun, casual atmosphere at many restaurants in Quebec city. 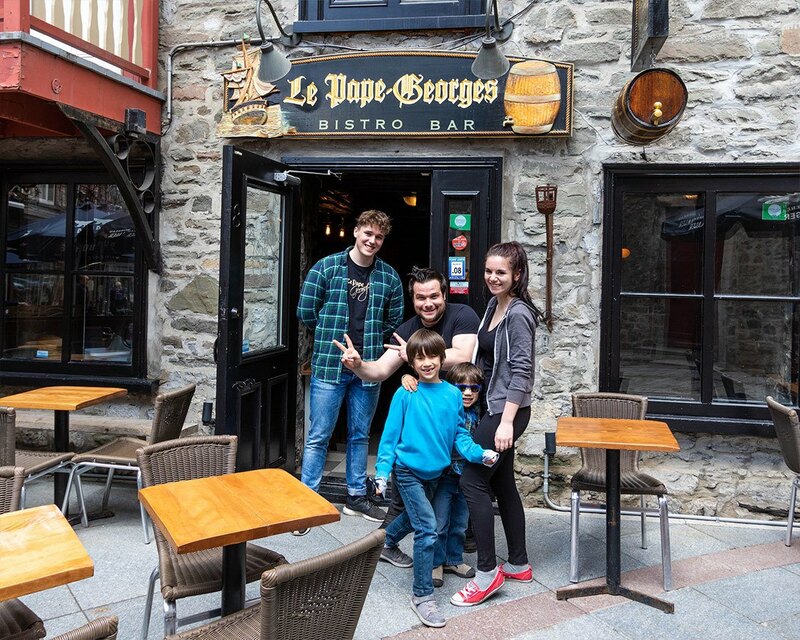 Le Papes Georges on Rue Cul de Sac is a great casual family-friendly pub in Lower Quebec City. Not only is Canada’s second oldest tavern one of the coolest places to visit, it also has great food. During the day Le Papes Georges has a great patio and one of the coolest atmospheres in town. During the evening, this popular pub often hosts live music and big crowds. Chez Ashton started back in 1969 as a traveling food truck. By 1972 owner Ashton LeBlond introduced his latest creation, Poutine. Poutine, if you aren’t familiar with it, is a dish of french fries topped with cheese curds and gravy. By 1976 the business had grown to the point that he could have a permanent location. 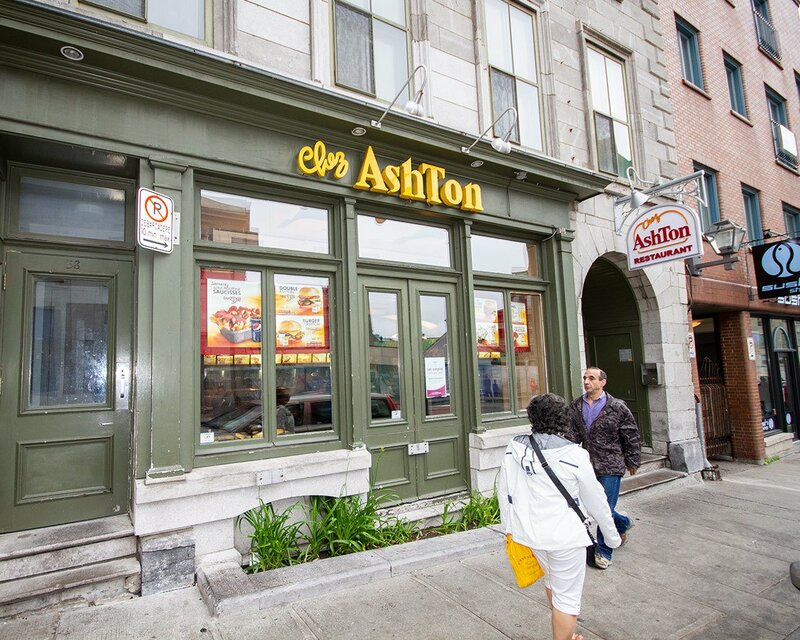 Now there are over 25 Chez Ashton locations throughout Quebec. For those experiencing things to do in Quebec City, visit the location near the corner of Rue St. Jean and Cote du Palais. La Buche offers traditional Quebecois fare. This cozy, cabin-style restaurant cooks up meals and serves up meals like deconstructed shepherd’s pie, poutine, and much more. They often have live music in the evening and is a popular destination for families in Quebec City. La Buche restaurant is located at 49 Rue Saint Louis. You can check out their website here. It’s not hard to find great hotels in Quebec City. This popular tourist destination has many incredibly popular places to stay in. Here are a few of our favorites. There is no more iconic hotel in Quebec City than the Chateau Frontenac. Not only is Chateau Frontenac listed as a National Historic Site of Canada, but it is also the most photographed hotel in the world. 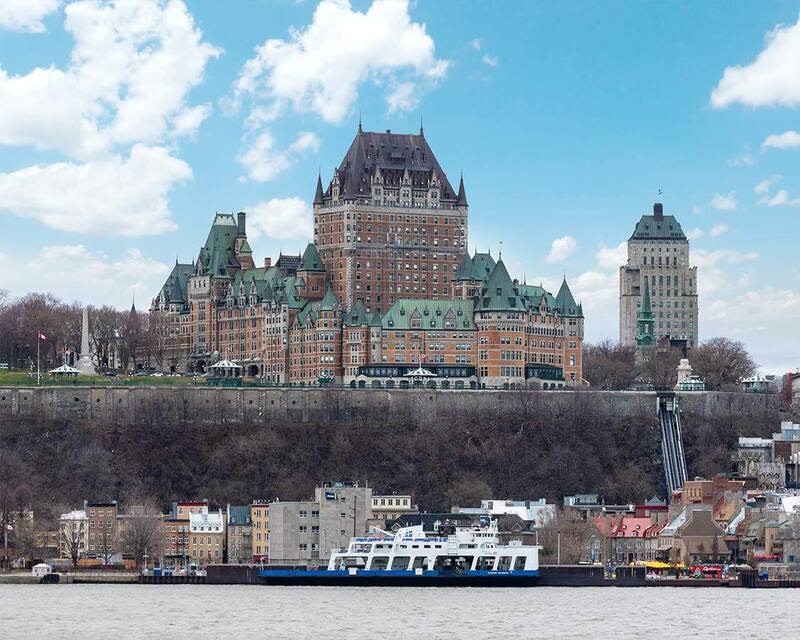 The great location of Chateau Frontenac means that you have easy access to the best things to do in Quebec City. The luxury rooms combined with three hotels and friendly staff make this one of the best hotels in Quebec City. You can find the best prices and availability on booking.com here. Situated among the Old Port in Quebec City, Auberge Saint Antoine is a popular Quebec City hotel known for incredible service. There is often live music in the lobby and a collection of artifacts from Quebec City’s history. You can check out the best prices and availability on booking.com here. Strolling the walls of Quebec City with kids is a real treat. 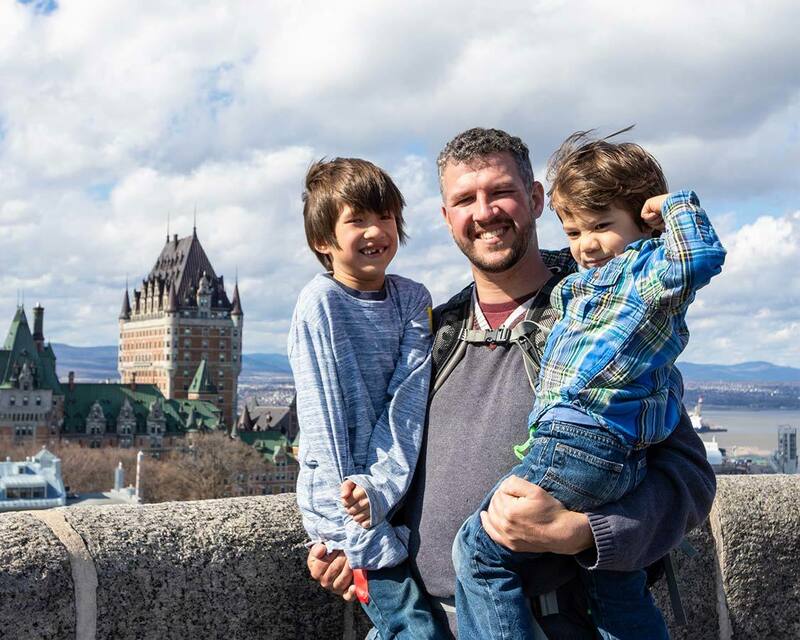 In fact, during my last visit, Christina was at a conference and I had a chance to explore Quebec City with the boys by myself. 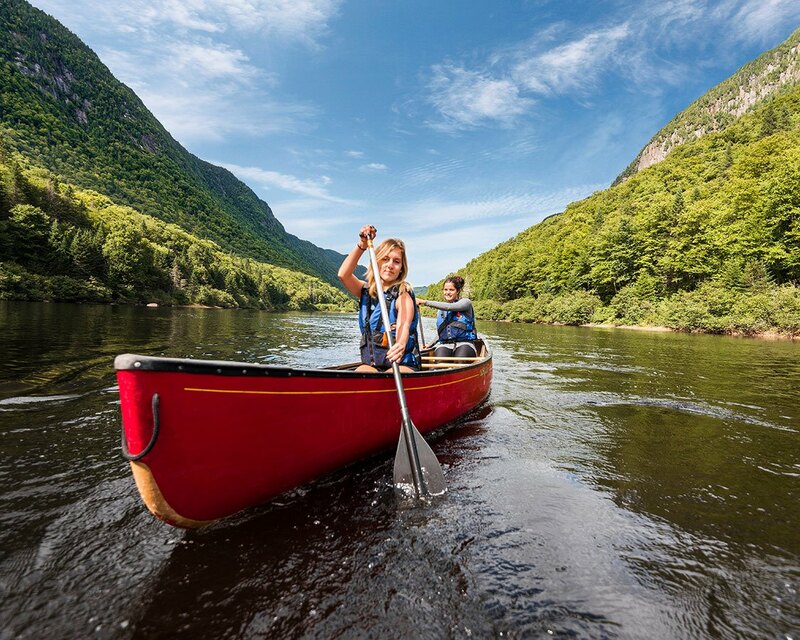 There are a lot of things to do in Quebec for kids, and luckily adults will have just as much fun doing them as the kids. From the alleys full of art to the historic buildings that make exploring Quebec City with kids like a trip back in time. The aquarium is a popular destination for kids in Quebec City, but all of the amazing wildlife areas near Quebec City will also keep the whole family busy. Keep yourself entertained by taking in all of the amazing things to do in Quebec City above. And also enjoy all the tremendous street artists and magicians that line the alleys of Old Quebec. Have you ever visited Quebec City? Tell us about your experience in the comments below. Or, head over to our Facebook Page and share a photo of your travels. We would love to share in your journey. Quebec City sounds incredible! I visited Montreal last year and have been wanting to explore more of Quebec. Is there a time of year that you would recommend visiting? That depends a lot on you and how you love to travel. I love the warm weather and patio season of Quebec City during the summer. But it’s also beautiful when it’s a rainbow of color in the fall season. 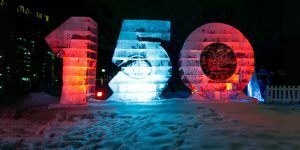 And if you don’t mind the cold, the Quebec Winter Carnival is the largest winter carnival in the world. The entire city is one big festival at that time.